RIP Stuart Scott, who died Sunday at the age of 49. A little late with the weekly roundup thanks to having the worst sleep schedule on planet earth. Despite a legitimate Week 10 schedule for non-conference games, the West went 15-7 with a +10 point differential. That margin of victory made for a Pythagorean record of 17.6-4.4. Looking at the season so far, Week 10’s 2.6 win difference between the two win metrics is the largest we’ve seen this season. COOL. PYTHSANITY. 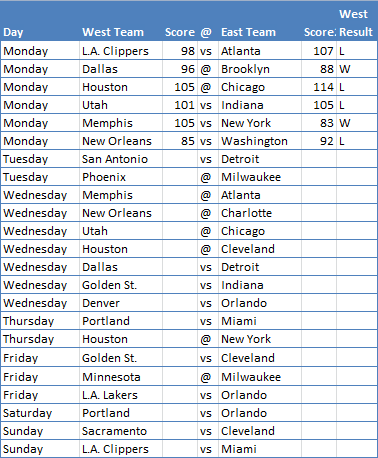 Wiz going through HOU-DAL-OKC-SAS-NOP in 7 days looks like all kinds of hell. Atlanta was/still is in good shape, though, having won at Utah and Portland on a back-to-back and the Clippers yesterday. WHOA. The top-5 or so out East gives the conference hope but it’s only January, for better or for worse. Week 10 wasn’t pretty for all West teams anyway. The Sacramento Kings continued their downward spiral by going 0-3 on their road trip at Brooklyn, Boston, and the rising Detroit. 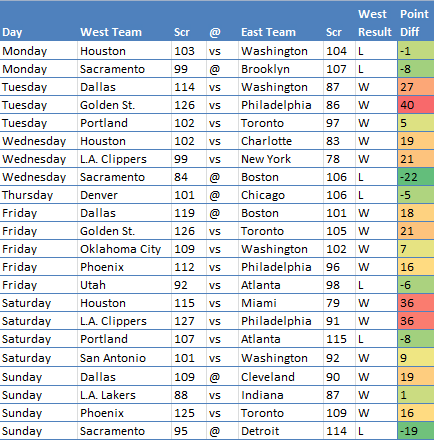 The West enjoys another week of more home games, 14-9, though they already lost three of them. Cleveland, Detroit, Indiana, Miami, and Orlando will be traveling while Atlanta and Washington finished up their road trips last night. Maybe this week will be different for the East. There are a lot of games featuring decent to pretty good teams from that conference and maybe they can squeak out an extra win or two compared to last week. But I’m not that picky. Losing by less than 20 points works, too. We need some more games that go down to the wire, specifically Cleveland @ Golden State on Friday.